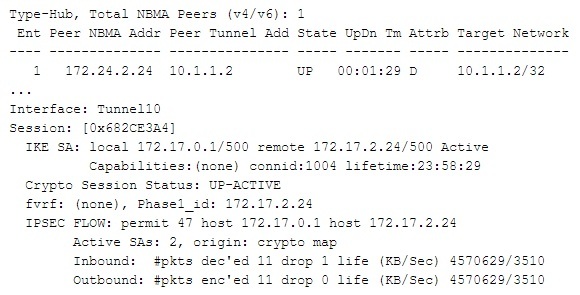 Which Cisco ASA application plugin allows for connections to WinFrame-based terminal services? Which command is used to verify NHRP mapping information on a DMVPN? Users are unable to establish clientless SSL VPN connections. The most basic requirements for a functional SSL VPN have been verified. Upon further investigation, you notice an SSL lib error recorded in the logging information. What is the most likely reason why users are unable to establish connections? A. There is a cipher mismatch. B. The VPN server and client are using mismatched SSL ports. C. There is no IP/TCP connectivity between the VPN server and client. D. The SSL VPN is not enabled on the correct interface. Which PKI component is used to bind the name of an entity to its public key? Which method of certificate enrollment using SCEP automates the enrollment of Cisco AnyConnect users? A. Multiple IKE sessions are established. B. Direct routes to other spokes exist from the spoke. C. A single IKE session is created. D. Spokes are reachable over the hub. What command is used to enable authentication, authorization, and accounting? Which Cisco IOS FlexVPN benefit provides three different models to implement it? Which type of certificate is required for clientless SSL VPN connections to the Cisco ASA? 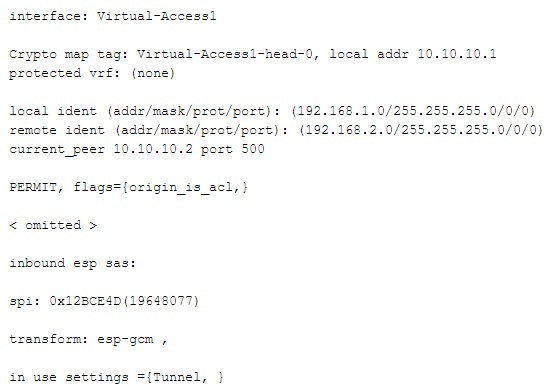 When using smart tunnel-based application access with SSL VPN, what happens directly after a user connects and authenticates to the SSL VPN portal? Which FlexVPN configuration block specifies an acceptable combination of security protocols and algorithms for the IPSec SA? Which option correctly defines the action that takes place when a DTLS-based VPN loses a packet? A. The VPN endpoints will retransmit the dropped datagram. B. The TCP stack of the application endpoints will retransmit the datagrams. C. Both the VPN and the TCP stack of the application endpoint will retransmit the datagram. D. The datagram is not retransmitted to reduce latency. You are configuring split tunneling on the Cisco ASA device via the CLI. You have created an access list named "STACL". Enter the command to specify this access list to be used for split tunneling. Which attribute would you use to apply an ACE to a user session? A. On the Cisco ASA, configure IKEv2 as the primary protocol. B. In the client profile, configure IKEv2 as the primary protocol. C. Deploy the IKEv2-enabled profile to the endpoint computer. D. Ensure DTLS is enabled on the Cisco ASA's interfaces on which the appliance accepts connections. What common clientless SSL VPN issue involves troubleshooting by analyzing the integration with an external server such as Cisco Identity Services Engine? Which IPSec encryption mode is the most secure? Which information is used to determine whether a tunnel negotiated via Phase 2 is operating?